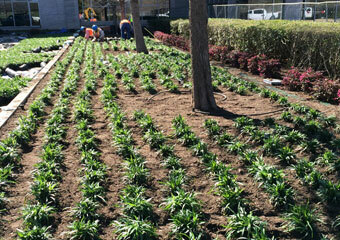 Coastal Spray has over 30 years of experience working with industrial and commercial landscaping sites. Coastal Spray’s clientele ranges from industrial refineries to commercial office buildings. So, whether you are located inside a Transportation Worker Identification Credential (TWIC) required site, industrial site or commercial site, Coastal Spray is available to meet all your landscaping needs. Coastal Spray offers a full range of landscaping services – from design to installation and maintenance. We have a track record of completing projects on time, on budget and safely. Experienced and safety qualified maintenance teams set the standard each day in planting, weed control, irrigation management, maintenance and repair. Additionally, we have three licensed irrigators, ensuring that your irrigation installation is completed in a cost-effective and environmentally friendly manner. 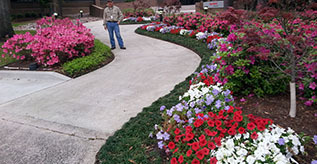 Coastal Spray has the equipment for any landscaping job you may need. We utilize a very aggressive maintenance schedule to ensure our equipment is always in good condition. Our landscape crews are always prepared for changes that might need to be made immediately. Whether your need is emergency post-hurricane clean up, preparing for a freeze or emergency irrigation repair, Coastal Spray is fluid enough to service it. Coastal Spray is licensed in Texas, California, Illinois, Indiana, Kentucky, Louisiana, Michigan, Mississippi, Ohio, and Tennessee.